I took advantage of our amazing January weather to do a quick overnight on California's Central Coast, specifically at Shell Beach. Great trip in an airplane: instead of a boring four hour drive I had a beautiful 75 minute flight down the coast in to San Luis Obispo. I stayed at the Spyglass Inn, an unremarkable but pleasant beachfront motel with a nice view. It's inexpensive and conveniently next to the Dolphin Bay Resort. I would have felt ripped off if I'd paid the $400 to stay at the resort but being next door I had the same view and could walk over to Lido for some of the finest dining on the coast. Nice dinner: abalone from Cayucos, also dungeness crab. Also good breakfast the next morning nearby at Zorro's. There's not a whole lot to do on this part of the coast. Off-roading on the beaches and sand dunes down at Oceano. Enjoying the views from the cliffs. Butterflies in Pismo Beach (in winter). The beach itself, although Shell Beach is too tiny for that; you want Pismo Beach or Avila Beach for a big expanse of sand. Mostly it's just beautiful. Pismo Beach is also near to San Luis Obispo and Paso Robles, two nice towns inland in low valleys. There's good wineries in the area, particularly around Paso Robles. It's hot in the summer but on a sunny winter day it's terrific. Basically the Central Coast is a really nice, mellow part of California. I like it every time I go. The whole coastline from Avila Beach to Oceano is one big stretch of tiny beachfront communities. Pismo Beach is the center and the biggest town, with the most bars and cafes and the most sand. Next time I visit I might stay at the Kon Tiki Inn or maybe the Avila Lighthouse Suites for something more remote. Flying around Texas where I grew up. We landed at 06R in Bellville, TX, where I was born. Tiny little airport but adequate, also had fun circling the town looking for our old house. On the way home we also stopped at KJDD near Mineola, TX where my grandfather was from. While at that airport I met Wayne Collins who knew my family and had flown a little Bonanza all the way to Adelaide, Australia. Visiting St. Mark's, Florida, a beautiful wet part of northern Florida with a surprisingly rich history. Totally worth a visit if you're in the area. Hanging out in Key West for New Year's. Ken and I were surprised at how much we liked it; beach towns aren't usually our thing. Key West is just busy enough to be fun without being overwhelming, it's laid back, there's great restaurants, and a definite non-conformist streak to the town. Would be glad to go back. Pretty much all those places worked out pretty well, I was pleasantly surprised by both Mobile and Lubbock. The big disappointment was New Orleans, we didn't have enough time to enjoy the city and Bourbon Street has gotten pretty unpleasant. Next time around I'll head to Frenchman St for music. My only real regret on the trip was we were in such a hurry to get across the country we didn't see much of the country; I'd love to do a trip like this where I only need to fly three or four hours a day. Awhile back I endorsed Rebit as a Time Machine like backup for Windows. I just deleted it from my system and can no longer recommend it. I don't think it's terrible, but the reasons I gave up on it are sort of interesting. It's noisy. Rebit is designed to run all the time, which means it's constantly writing to a chattering external drive. It was irritating enough I started turning off the drive most of the time. It's intrusive. Rebit installs a Windows Explorer extension so that when you right click on a file, it offers a menu of options. They did it wrong somehow and it added 300ms+ of latency to interaction. It's buggy. At some point an upgrade of Rebit failed. It kept trying to "upgrade" to an older version. Their support folks tried to help me ("delete this magic file!") but it didn't fix the problem. Also, maybe related, I lost confidence it was actually making backups. It's confusing. I bought "Rebit Backup Software". That product is no longer offered, they now sell "Rebit SaveMe". I think it's a different program, but I'm not really sure, and can't be bothered to find out. These kinds of problems are typical for software. Geeks like me will often spend a lot of time figuring out how to work around the problems, find the right version of the software and the quiet hard drive and understand it. But for Rebit I couldn't be bothered. So I uninstalled it and switched to manual backups using the built-in stuff in Windows Vista. It amazes me there's not a really good versioning filesystem for consumer computers. We've been doing it in Unix and VMS for 10+ years. Apple's Time Machine gets mixed reviews from what I've heard. APRS is an interesting system, a network for wireless transmission of data packets to the Internet. It's global, free, and low latency. APRS is often used to provide location tracking of vehicles but can route any short text message. It's a great example of amateur radio hackers meeting Internet hackers and echoes other much loved networks like Fidonet or Usenet. APRS lets you send short messages from a handheld radio to the Internet through the simple expedient of broadcast and repeat. A user broadcasts a new APRS message on a VHF band. Nearby fixed stations ("digipeaters") hear the message and rebroadcast it to other nearby digipeaters, so the message floods the digipeater network (within path and hopcount limits). Eventually an APRS iGate hears the message and forwards it into the Internet where it is published to the world as part of a single, global APRS message stream. Not very efficient, but reliable and well suited to short messages. What is APRS used for? A big application is location tracking, with radios beaconing out location and speed every few seconds. Here's a friend's training flight. Location packets are a big part of the APRS spec, but there's also arbitrary text and email and SMS-like applications. aprs.fi gives a good map-based view into APRS activity, and here's what The Matrix really looks like. So what's the drawback to APRS? It's amateur radio, which means strictly non-commercial and you need a license to use it (10 hours of study). Private data is not supported. And it's all hackerware, some assembly required, although recent radios like the Kenwood D72 are pretty turn-key. The real limit to APRS is that it's the sort of gentle hacker network that's maintained by love. I suspect it wouldn't handle the strain of 100x as many users or commercialization. The broadcast design makes for limited throughput and the community process probably wouldn't handle business interests well. Sort of analagous to the pre-1993 Internet. Nothing wrong with that, but I suspect we'll never see APRS-based location tracking for the mass market. We bought a sous vide cooker. We only got it yesterday and all I've cooked in it was an egg, but already I've got some thoughts. The appeal of sous vide cooking is easy precision. You dial in a specific temperature to a water bath and let your eggs, or meat, or veggies hang out for an hour or two at that temperature and you get perfection. The variance in temperatures is amazing. 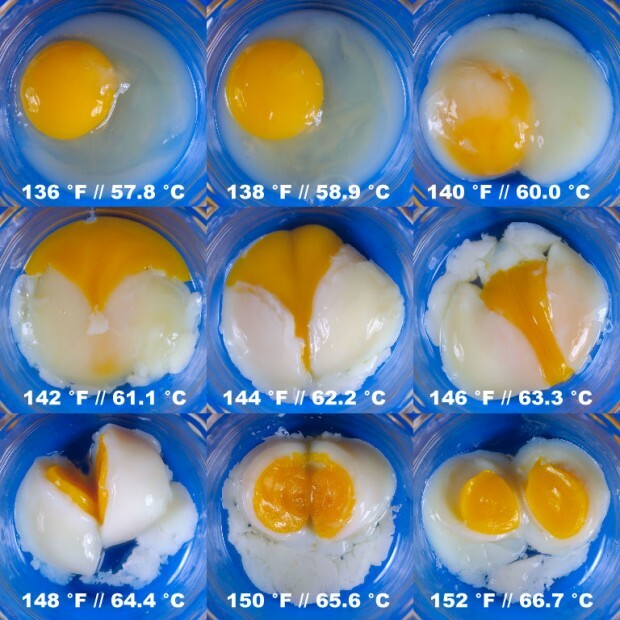 Eggs go from runny (but pasteurized) to hard between 58°C and 70°C. Beef goes from rare to medium between 51°C and 60°C. Traditional cooking on a hot stove requires the cook control the final temperature with time. Sous vide lets the cook just set an exact temperature and forget it; there's no risk of overcooking. For someone like me with no kitchen skills, that's very appealing. But so many caveats. First, sous vide cooking is slow. A hamburger takes 2 hours. A big chunk of meat can take 2 days. It cooks entirely unattended but you do have to plan ahead. A related problem is you can only cook to one temperature; no cooking both your meat and your veggies in the same bath. And when the sous vide step is complete you're not finished. Meat still has to be browned or seared, and seasoned, and finished. And while an egg yolk may come out creamy at 63°C if you want a firm white you need a final hot boiling step (carefully timed). The other issue is equipment. The Sous Vide Supreme we bought is pretty well built, but at $450 it's an awfully expensive gadget. It takes up a lot of space. And you really want a vacuum bag sealer to go with it, another gadget. I fear if we store the kit away next to the mixer, the food processor, and the blender we'll never use them. I'm optimistic the sous vide cooker will get some good use in the house. It's simple enough even I might be able to cook well with it. But it's got some drawbacks. One thing I've never quite understood is why there's such a divide between the Internet / Web tech world of companies like Google or Twitter and the game development world of companies like Blizzard or EA. Computer games have often had terrible Internet experiences, awful web sites, etc. The game companies are catching on now but there's still a huge culture divide. So that's why I like my friend Chris' job posting for an online engineer. It's a job at a top tier game company, Irrational Games (of Bioshock fame, also System Shock 2, Freedom Force, and the upcoming BioShock Infinite). But it's for a deeply Internet nerdy set of skills: scalable web backends, NoSQL storage, protocol design, etc. It sounds like it'd be a fun job for an Internet / web developer looking to do something new. Games have a totally different interaction with users than web sites, real time and intensely emotional. Different technical environment, too. For nearly two years now I've been using various hacks to remove the useless left navigation bar from iGoogle. I'm currently at an impass and can't turn it off; none of the Chrome extensions I can find work. Even Frugal iGoogle, a recent and well designed extension, fails. The underlying problem is changing page layout. My last workaround broke when I was put in an experimental iGoogle layout littered with icons. Deleting cookies fixed that but iGoogle still redirects itself to the URL http://www.google.com/ig#t_0. The left nav is now implemented in a table element, of all things, with a class of GL-BX4-BFS. That seems to be new. The real problem is the iGoogle design itself. There's at least 4 Chrome extensions to remove the left gutter. It's a small nuisance but a regular one for a default start page.